Citation directories are an essential component of your local marketing system. They need to demonstrate to Google (and other search engines) that your Dental Practice is local, active with a real bricks and mortar physical location. 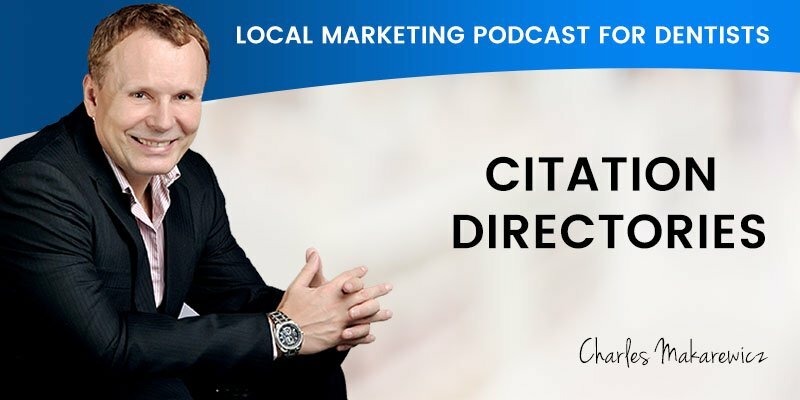 Scott: I’m Scott Edwards and today I have Charles with me to discuss citation directories and how they are an essential component of local marketing to demonstrate to Google and other search engines that your dental practice is local, active, and a real bricks and mortar physical location. Charles is the founder of Dental Marketing Expert, a company which specializes in local marketing for Australian dentists and who is responsible for many dental practices across Australia dominating in local competition and attracting up to 15 new patients each and every week. Welcome to the show, Charles. Scott: I suppose for a dentist, Charles, many would never have heard of the term “citation directories”, or even know what they are. Could you explain to our listeners what we refer to as a citation directory? Charles: Citations directory, in simple term, is just a reference, a web reference, to your business, to your dental practice. And we tie that up with Google Local or Google Maps. Our previous podcast was covering that, so please go back to our podcast page and revisit that. It’s very important to learn more about Google Local. Coming back to that, Google Local, Google Maps, that’s where a majority of your bookings will come from, online bookings. So what we’re trying to do, we’re trying to reverse engineer what the Google Maps needs and we know as a fact it wants to have accurate information. Google Maps is a search engine, and it’s an aggregator. It searches for your business references online. And it wants to see accurate information. If there’s a difference in the phone number or difference in the business name, it gets confused and basically lowers your Google Maps ranking. Scott: So Charles, how many directories are out there for dentists to list their practice in? Charles: Oh, hundreds and hundreds. We have some clients who have been with us for a number of years, and they could be hitting a 400 mark. And the clients who are starting with us, building slowly, 10, 20, 30 directories. Every month, the number will increase. Our goal is to basically get as far as having around 500 directories, over two, three, four years. In perhaps two years, we’re looking at two to three hundred. Scott: So why should dentists be listing their practice in as many of these directories as possible? Charles: Citation directories will list your business and, Google will aggregate that information. Having a lot of listings will help with the Google Maps ranking, but also the directory itself, may have a huge exposure online. Well, Google algorithm doesn’t favour anything. It just favours the searcher. It gives the most relevant information to your patient, not necessarily to Google itself. So that’s a good news, I believe, that is why we can see those listings. And there are directories which are more important than others, and I highly recommend that the first work begins with the 30 most important citation directories. Scott: So is listing your practice a simple task, or is it a time-consuming, ongoing process? Charles: It’s definitely a complex and time-consuming, as well as a resource-hungry process. Just give you an example, just to verify Google My Business listing, a lot of times you might be asked to request a pin via post card. When you complete the listing verification, you might have a few options. In many occasion, it will be just one option, a verification pin sent by post card. And that might take a few weeks to verify. And guess what? A lot of times, that post card disappears, never gets there. So that client needs to wait for up to five weeks before they actually get the Google My Business verified. The beginnings could be really hard for the new dental practices. Additionally, if you look at other platforms, I use citation directory for everything, to simplify that for dentists. Because there are a lot of jargon; there are a lot of differences inside that citation word. There are search engine. There are aggregators. There are all sorts of different things, but at the end of the day, what we’re looking is we’re reverse engineering Google Maps and looking at what actually Google wants and what they’re looking for. And they’re looking for the information online, in regards of your NAP (name, address and phone number), which is the reference point to your business. And additionally, things like your bio, a little thing, images, and other information’s important there. But the NAP is critical. So Google looks for accuracy of that within citation directories. Coming back to your questions Scott, there is a lot of difficulties with finding all the directories. There’s additionally a lot of information which is not gonna be accurate. So trying to find the logins, trying to contact the directory and request authentication of the account. A lot of them will answer, “Hey, but where is the owner? I need the owner to verify the account.” And then you’re will have to go back and forward via email or phone. The first 30 directories are the hardest to verify and to deal with, because a lot of them will require access to the reception phone number, to verify your info. And perhaps using your company email, so you have to go back and forth. Your reception has to be busy replying to all those emails and forwarding them to the citation directories. Additionally, if you look at from 30 to 100, 200, 300, a lot of the smaller directories are very slow. So you might post your listing and then you wait. You might wait two, three, four months before they actually get verified. So the process is very time-consuming, and the key here is the accuracy of your listing, so you have to make sure that you have a spreadsheet there, and you list all your current citations and have your own notes, what specific stage they are in. And other new opportunities for directories, which you will need to actively search for, because there’s always new opportunities. There’s always new citation directory popping up. Scott: So Charles, how do citation directory listings actually help a dental practice attract new patients? Charles: We talked about this before. It’s visibility. So the citations directory are visible in the home page of Google, on the second page of Google. They’re everywhere. Additionally, having that accurate listing helps you in Google Maps, which is the one we’re really interested in. Scott: So if I opened a new dental practice at a new location, is the citation process any different than if I bought an existing practice and rebranded? Charles: Oh, it’s definitely more difficult to deal with re-branding, and if you look at the Google, Google will be very confused if you just set up a new website. So you have existing Google My Business listing, and for example, you purchased the dental practice from another dentist, which was Doctor John Lee, and you say, “Well, I can’t use that, so I have to rebrand it.” And you know, ideally, you look at the area you were in, so perhaps you were in Robina and you picked the dental practice name which has some key words in it, which does help. So perhaps the Robina Dental Center, or the Robina Family Dental Center, or something like that would have been appropriate. So you had that name now and you set up a brand new website. And obviously, you branded it. It’s in your NAP. It’s in your Contact Us page, and you manage to claim the existing listing for Doctor John Lee and you change the name there. So you think it’s all done. Well, that would be nice. No, it’s a mess. There might be a hundred or hundreds of listings up on the Internet in citation directories where your address is correct, your phone number is correct, but your business name is not. So Google will look at it. And it will get very confused, so even if you were ranking, you’ll get those negative credits, and most likely your ranking will dive in. Or if you’re trying to build the new ranking, that simply is not gonna be easy to do. If you want to just rebrand the logo, change the colours of the website, that’s ideal. And if you can avoid not touching the NAP itself, name address and phone number, that saves you months and months, and also, that’s additional bookings. So I would think you might have a huge drops in bookings if you’re rebranding. It might be over a period of six months, or if you’re really working very hard on citation, maybe three months. But I’ve seen anywhere between three and six months, a huge effect on your Google Maps ranking when you’re rebranding. Scott: What if my dental practice has multiple locations, Charles? Charles: Okay, great question, Scott. It’s a little bit different approach. We prefer internally to have a client who has, let’s say, two, three locations, and they’re completely separated. So let’s go to two locations. You have two locations that have two websites specific to that locations. And two of everything. Two Facebook pages, and I know it’s a lot more work, but those could be on opposite side of town, and it’s serving different community. So that community would benefit from a dedicated website, from dedicated Facebook page which just talks about that community. And Google loves that specific system. Google loves to see one website, one branding, and then all the citation directory pointing out back to that specific website, and have accurate NAP information. So this is the ideal, and that’s utopia. Not always possible. So let’s look at another scenario. Perhaps you don’t have a choice. You already made all the decisions and you will have three locations and you have only one website. Number one, make sure when you’re setting up, you obviously have three different Google My Business listings. So every listing, you could perhaps have the same name for those three. So if the name was, let’s say, United Smiles, the name is the same for those three locations, I would try to rebrand it slightly. So you have a United Smiles Robina, United Smiles Carrera and a United Smiles in another suburb. So I will rebrand this as much as possible, to give you the benefits of the suburbs keywords. And that will be probably one of the things you could do. And the second step is to create landing pages to match your locations. So it will be /website/Dentist-Robina/ and /website/ Dentist-Carrara/. Now, the Google My Business listings for Carrara should not point to the home page of your website. It should go to the Dentist Carrara landing page, which has that accurate address on that specific page, and a lot of other information about your services optimised for Dentist Carrara. And the same for other locations. Well, that’s a bad move, because Google is very confused. The address doesn’t have a Gold Coast now, and which location is Gold Coast? You’ve got three. It is not a good strategy, so I really recommend against it. I think the best strategy is to focus on your local community, focus on your local suburb, up to five kilometers to start with, and dominate first, rather than go for the whole city. Scott: Let’s briefly recap. Citation directories are essentially an online reference to your dental practice. It is essential to list and then maintain consistent NAP details across all directories. Google then aggregates all these listings to validate you as a genuine, active business and ranks you in their search results. The more relevant directories you are listed in, the greater authority you portray to Google and increase your exposure within search engines, which, in turn, delivers more new patients. We’ve covered a lot of information again, Charles. Thanks again for your time. Scott: And that wraps up today’s podcast, folks. Stay tuned for our next episode, when we discuss local community engagement and mixing it up, both online and offline. 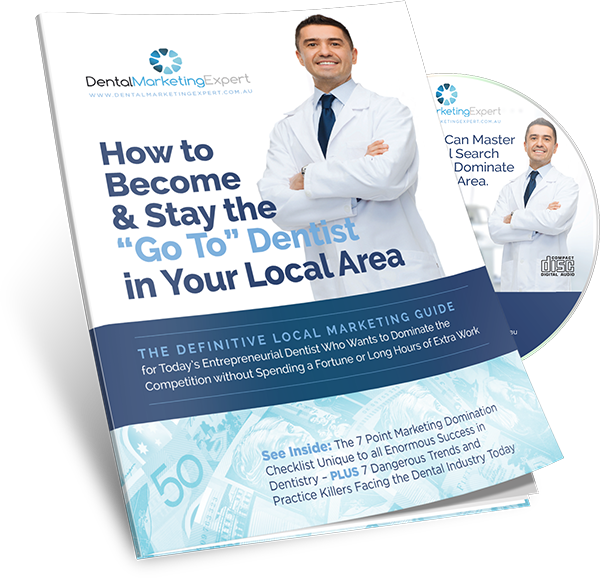 Includes a FREE copy of the popular book, “Local Marketing for Australian Dentists” – a further $29 in value!